I am so happy to announce that "Wholesome Wholegrain Cooking - WWC" has come here to Kaarasaaram for the month of July. This event is the brain child of Sanjeeta KK of litebite.in . The title of the event says so much about the purpose of healthy diet for a healthy body and mind. Another interesting concept of this event is that it is more specific to the meal time : dinner/breakfast or lunch. It takes out the stress of searching for recipes specific to your meal time or ingredient of choice when you don't have the time to browse through hundreds of reicpes that come up in the search engine. We all know the benefits of cooking wholegrain stuff. Whole grains are like complete packages : packed with dietary fibre, vitamins, minerals, proteins, phytochemicals and complex carbohydrates. 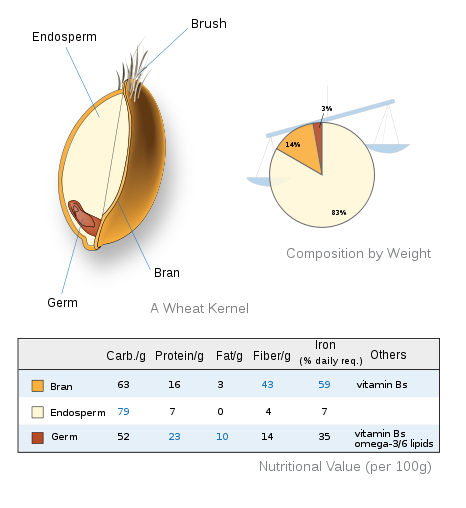 Wholegrains are cereal grains with cereal germ, endosperm and bran. The refined variety contains only endosperm. Wholegrains can be sprouted but refined ones cannot. *Lowers insulin concentration suggesting reduction in Type 2 Diabetes risk factors. *Reduces the incidence of hypertension, diabetes and obesity which are dangerous to health and are which ultimately leads to "Heart attacks". *High in fiber means you feel fuller for longer and also relieves constipation. *Low in GI which releases sugars slowly into the blood. A health survey in UK suggests a simple bowl of wholegrain cereal reduces the risk of 2 major killing factors : heart disease and cancer. A new campaign called "Wholegrain for Health [WFH] " has been launched which suggests consumption of wholegrains can save around 24,000 lives in UK alone.... now that is wonderful news. *It is rich in antioxidants and phytonutrients with high concentrations of lutein and zeaxanthin. *High in dietary fiber which provides lots of chewing satisfaction. *The fibre nourishes lower intestinal tract and reduces the risk of colon cancer. *Provides 5-6 gms of protein, abundance of Vit B complex and folic acid. *So you can prepare anything from soups / savoury cake bakes or muffins / veggie stew or kurma / salads / sandwich fillings / pizza topping / casseroles / grilled ones. *Prepare any dish with corn as the main ingredient. Only vegetarian dishes and no fried items please. *Post the recipe in the form July 1st to July 31st in your blog. Old entries can be sent only if reposted and linked to the announcement pages. *Please kindly link to this announcement page and Sanjeeta's announcement page .Last date for sending the entries is July 31st. Wonderful write up, Reva! Looking forward to cooking with 'Corn for Dinner'. Happy hosting. hmm..sounds like a great and healthy event..will try and send my entries..happy hosting!! wonderful event !! happy hosting !! Corn is a versatile theme.. would try to come up with something..
nice event, will try n' see what i can come up with...have a great event! corn is so versatile, so a great ingredient choice. ..count me in!! Good choice...will send my entries . Nice event! I also found the information you have provided very useful . Sounds like a healthy and delicious theme. Can't wait to see all the yummy entries. Meanwhile, happy hosting! Nice Event, will send my entries soon. Thanks dear for updating it! !